From the perspective of the Kremlin, Syria has been a great success. Following the surprisingly successful organisation of a transatlantic response to the Russian invasions of Crimea and the Donbas, the Russian intervention in Syria not only managed to prop up the Assad regime and reverse the course of the civil war, it also made sure that the Russian Navy would get a naval base in the Mediterranean. And most importantly: it forced the West to again talk directly with the Kremlin. This was not only a case of Russia playing a rather mediocre hand very well, but also of several events outside of Putin’s control lining up favourably. These include both Iran and Hezbollah intervening, as well as the Turkish turn-around following the failed coup of 2016. The introduction of Russian long-range air-defence system, including the S-400, into Syria caused further alarm amongst western observers, with some going as far as stating that no assets in theatre beyond the F-22 Raptor “has any ability to operate and survive” inside the 400 km range of the system’s 40N6 missile. I have earlier on the blog cautioned against drawing rings on maps and stating that they are any kind of steel domes inside which anything and everything will be shot down, and this is very much the case for the SAM’s at Khmeimim Air Base as well. The latest strikes on targets in western Syria, including those well-within 100 km of Khmeimim AB, showed that coalition aircraft can strike presumably protected targets without issue. And not only that, if one looks closely at the map, the 400 km range extends well beyond Cyprus. The very same Cyprus which was the base of the RAF aircraft participating in the strikes. In other words, British aircraft took off and landed inside the stated range of the system, and all cruise missiles, both ship- and air-launched, penetrated the bubble without seemingly any of them having been intercepted. The short answer is that Russia, according to Washington, didn’t try. There is said to have be no indication that the S-400 was fired against anything, and most likely this was a political decision. However, it does tell you something. Russia blinked, they know they blinked, we know they blinked, but we will pretend they didn’t. If Russia had the magical steel dome that some lay out A2/AD to be, why didn’t they at least swat down some of the cruise missiles, even if they decided to leave the aircrafts themselves (or rather, their pilots) alone? At the crucial moment, Russia decided not to try to protect the assets of their ally. Whatever the reason, the result is a razed block in the Syrian capital. However, while there without doubt are intelligence services around the world plotting the decision as yet another data point, the immediate outcome isn’t necessarily too dramatic. As TD noted, the West will continue to act like Russia didn’t blink, and Russia will continue to claim that they control the skies over (western) Syria. The problem is that while Russia might be the great power on location in Syria, the other actors, including Assad, Iran, and Hezbollah, all have their own agendas as well. More importantly, it is highly doubtful that any of them would hesitate to jump the Russian ship if they saw more benefits to be gained elsewhere. Enter Israel, which is likely the western state that has been cooperating most effortlessly with Russia. In part this stems from a pragmatism that is a strong part of Israeli foreign policy, but it should also be noted that current defence minister Lieberman (and a sizeable Israeli minority) is in fact born in the Soviet Union. By most accounts the Israeli-Russian deconfliction agreement is working nicely, with Russia more or less accepting Israeli strikes on targets in Syria. Israel has on the whole tried to stay out of the Syrian conflict, in no small part likely based on the experiences from the Lebanese civil war. However, a red line has always been drawn at the “transfer of advanced weaponry” from Syria to Hezbollah in Lebanon. What exactly constitutes “advanced weapons” is left open, but it is usually taken to include long-range rockets and ballistic missiles, surface-to-air missiles, and anti-ship missiles. The Israeli answer to transfers has been air strikes, often carried out with stand-off weaponry from Lebanese or Israeli airspace. As the war has been dragging on, the Israeli involvement has deepened at the same time as the Iranian impact on the ground has increased. While Assad constitutes a know quantity, Israel has been extremely wary of the long-term impact of allowing Iran a foothold in the region. And while brig. gen. (res.) Shafir of the Israeli Air Force a decade ago confidently could say that Iran is isolated in the Muslim world, recent developments have opened up avenues of approach for Teheran on a broader scale than has been seen before. The recent downing of an Iranian drone that entered Israeli airspace and the following air raids (including the first downing of an Israeli fast jet in a very long time) has increased the temperature further. A very worrying detail was the fact that Israeli media claims that the aftermath of the raid left Israeli prime minister Netanyahu with the impression that Russia has no real ability to contain Iran in Syria. The problem here then is that the logical conclusion is that Israel will have to deal with the Iranian presence in Syria alone, and while I doubt that anyone inside the IDF is dusting off the plans for a drive to Damascus just yet, a more comprehensive air campaign aimed at severely crippling the Iranian forces in Syria might be in the cards. While this kind of Israeli-Iranian showdown is bad enough in and by itself, the big kicker is how that would reflect upon Russia. Having two gangs fight it out on what should ostensibly be your backyard does not leave the onlookers with the feeling that you are in control, no matter how often you say so. In addition, if Russia goes through with the idea to supply the S-300PMU-2 to Assad, this opens up further risks of losing face. While the S-300 is one notch below the S-400, the system is vastly superior to anything currently in operation by the Syrians themselves. As such, it would likely be a prime target in any Israeli air campaign, and echoing the aerial battles of 1982, it would likely be destroyed sooner rather than later. This all would leave Russia in a bad light, and erase much of the gains in prestige and diplomacy that the Syrian intervention has so far given Russia (in certain places, one should add, as others are less impressed by people regularly bombing hospitals and supporting dictators who use chemical weapons). While attempts at predicting Putin’s next moves are notoriously hard, it is safe to say that he has not shown an inclination to count his losses and leave the table. Instead, when the rest of the players believe him to have overplayed his hand, what usually happens seems to be that Putin will press on regardless. And there’s no telling whether his next move would come in Syria, or somewhere else. The unilateral declaration of independence by the Catalan authorities naturally has continued to fan the flames of the conflict. A surprising sidetrack appeared when Finnish MP Mikko Kärnä congratulated the Catalans and declared his intent to bring the question before the Finnish parliament next week. Congratulations to the independent Republic of #Catalonia. Next week I will submit a motion to the Finnish Parliament for your recognition. Kärnä’s support for Catalan independence is nothing new, and he has earlier been on the receiving end of threats by the Spanish ambassador, who threatened that Spain wouldn’t support Finland in case the country would one day need “solidarity”. The tweet was quickly blown out of proportion, with a number of media outlets declaring Finland being ready to go against the stated EU policy of giving Madrid their full support. These include Sunday Express, who seems to have been the first to headline with Finland preparing to go against EU, as well as Scottish The National. It is understandable that a non-Finnish news outlet would find the story plausible upon first inspection. Kärnä is a member of the Finnish PM Sipilä’s Centre Party, and due to Finnish history the principle of right to national self-determination enjoys broad support amongst the population. This superficial look however misses the larger picture. To begin with the Finnish government has throughout the crisis expressed it’s clear support for the Spanish government, with FM Soini usually being the one who does the talking. Kärnä isn’t a heavyweight in Finnish politics (he only entered parliament upon the decision by fellow party member Paavo Väyrynen to remain in Brussels as a MEP), and that he could muster enough support to force the government’s hand against his own party leadership seems unlikely. Finnish popular support for a Catalan state is harder to judge, as most people treat the question with indifference, but there seems to be no room for whipping up a popular movement to force the hand of the Finnish government. However, what makes the whole thing even less likely is the fact that the decision to recognise the independence of countries does not rest with the Finnish parliament, but with the president himself, who does so in consultation with the government. Kärnä recognises this, and is himself open with the purpose of his move being to put pressure on the government to raise the issue with president Niinistö. Parliament can express its will to the government, which in turn then can present issue to the president. President Niinistö in turn is known for not making hasty or controversial decisions when it comes to foreign policy. Considering the important role EU solidarity occupies in Finnish national security thinking, it is doubtful if he would go ahead with a move that is so clearly contrary to the wishes of the EU leadership even in case of support from the government. That he would do such a move against the wishes of the government is more or less unthinkable. Professor Forss has for several decades been one of the leading authorities on Finnish defence and national security policy. For me personally his writings in Finnish daily Hufvudstadsbladet were one of very few sources on Finnish security and defence policy available in the pre-#turpo age. It is a great honour for me to be able to publish the post below where he examines the idea of the Finnish Air Force using foreign bases in greater detail. Corporal Frisk addresses the Finnish – Swedish issue about strategic depth, which started from the by now well-known Jane’s article. The picture that Jane’s paints, isn’t, however, very new. The idea of using a common strategic depth as an item to be introduced in Finnish-Swedish air force co–operation is actually more than twenty years old. The first to float it was – as far as former colleagues and friends now recall – the eminent Swedish air warfare analyst Bengt Andersson at the Swedish Defence Research Establishment FOA, now known as FOI. His thinking started from the premise that the Swedish Jas 39 Gripen and the Finnish F-18 Hornet shared enough common features, that Hornets operating from Swedish air bases was a realistic idea worth developing. The Gripen’s engine, Volvo RM 12 was developed from the General Electric F404-400 engine. The Hornet’s GE F404-GE-402 engine was similar enough to use the same fuel as Gripen at least temporarily and both aircraft also carried the same AIM-9 Sidewinder and AIM-120 AMRAAM air-to-air missiles. As for the Nordic defense co-operation project NORDEFCO, Col. Pekka Holopainen and myself described it in detail in our monograph Breaking the Nordic Defense Deadlock which U.S. Army War College Press published in February 2015. At that time, the air forces of Finland, Sweden and Norway had already conducted mutual Cross Border Training together for some time in the air space of the three countries. The air forces continue to exercise in this mode on a weekly basis and are already able to operate fairly seamlessly. The particular issue of strategic depth is indeed not new. There is a major practical problem, however, from a Finnish viewpoint. In the late 1990s Sweden had a marvelous dispersed air base system all over Sweden. It was called Air Base 90 and it consisted of 88 individual prepared road bases with full infrastructure, shelters, electricity, fuel and weapons storage facilities. The whole system was built upon the premise that the air force should be able to operate in a nuclear and CW environment. Then eternal peace broke out in Europe and this magnificent system was dismantled, except for two bases at Jokkmokk in Lapland and Hagshult in Småland in the south. Restoring Base 90 is impossible, but the Swedes are now trying to bring back something. With the Base 90 intact, strategic depth would have carried a lot more substance, seen from our Finnish perspective. A foreign friend also offered the following thoughts. In his opinion, it seems, there was no particular reason for euphoria regarding the strategic depth issue: “There is a bit of negative that should be added. 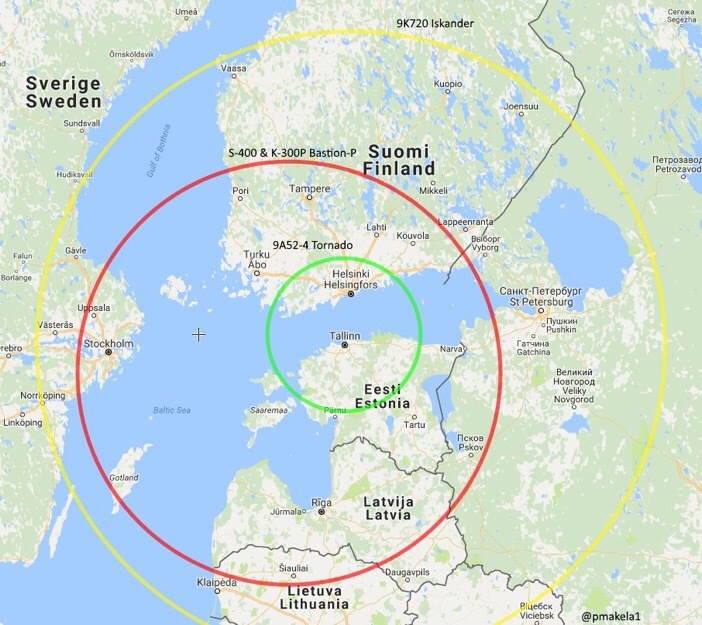 Why would Finland send aircraft to Sweden when it still would be in the threat ring of bad stuff and would be looking for support from bases with un-like aircraft? come very far in their efforts to be able to integrate fully should a political decision to do that be adopted. Norway is in the process of introducing the first Lockheed-Martin F-35 Lightning-II combat aircraft of the 52 ordered. Sweden is committed to 60-70 domestically produced Saab Jas 39 E/F Gripen aircraft. Ideas of keeping ‘surplus’ Jas 39 C/D Gripens operative have been floated. One leading Swedish security policy analyst Dr. Robert Dalsjö pleaded in August that 97 almost new C/D Gripens should be retained. Another senior Swedish defense analyst, Krister Andrén describes the Swedish needs for the 2030s as eight air combat divisions with 200 aircraft. 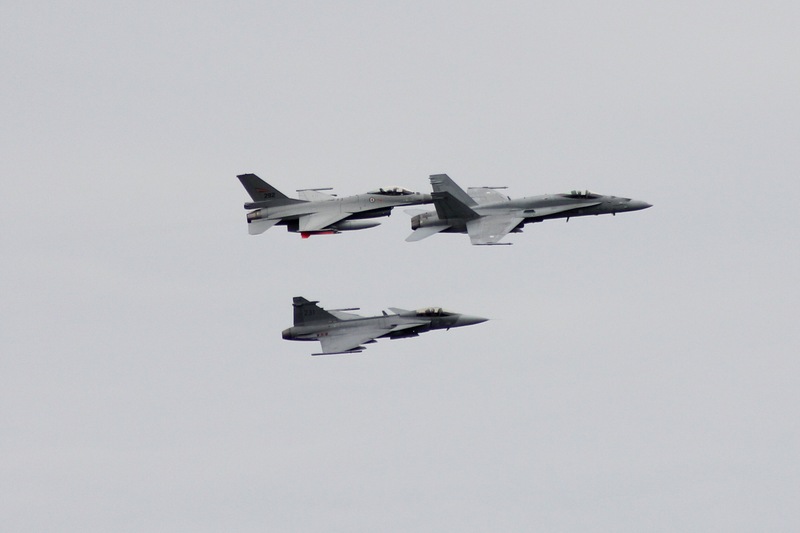 The Finnish Air Force has now concluded its second midlife update of its fleet of 62 Boeing F/A-18 C/D Hornet aircraft and is at present regarded as perhaps the strongest Nordic air force. Two Finnish Hornets plus pilots and support personnel are in the U.S. training to use the advanced JASSM long-range stand-off missile, which will be operationally introduced in the FiAF next year. At the same time the acquisition process to replace the Hornets has begun. Offers from five manufacturers of the next combat aircraft have been requested, and the planes considered include F-35A Lightning-II, F/A-18 E/F Super Hornet, Jas 39 E/F Gripen, Eurofighter Typhoon and Rafale. Final decision is to be made in 2021 and operational introduction of the new air craft beginning in about 2025. We are now four years from that decision. A whole lot of familiarization with both F-35 and the new Gripen will have been acquired by then in the routine Cross Border Training. Depending on how the integration process between the air forces proceeds, it may impact the final Finnish decision. Given that Sweden and Norway have decided on the aircraft for their fleets, the Finnish choice is the only open parameter left and it will of course play a role for the other partners too. The optimum Finnish choice isn’t necessarily the same if you look at things only from a Finnish national perspective or from the perspective of a combined Nordic air force. The planes that will fly in our common airspace the next 3 – 4 decades have their individual strengths but also weaknesses. For example, air-to-surface firepower is not one of the strengths of the small Gripen or the F-35 flying in stealth mode with weapons carried only internally. So, what plane will Finland eventually buy? It is of course impossible to tell. The purchase of the Hornet in the early 1990s proved to be a tremendous success and the Finnish Air Force enjoys respect wherever you go. Even more important has the security political dimension proved to be. Security political relations between Finland and USA then took a quantum leap. That is something Finland will not easily abandon, although there still are political factions in Finland which try to sabotage our relations with the U.S. the best they can. Views presented are solely those of the author. That is the headline chosen by Finnish news source Verkkouutiset when retelling Jane’s Defence Weekly’s recent story that the Swedish Air Force has been working on a concept of enabling Finnish fighters to operate from Swedish bases in times of crises. The idea is both extremely radical, and blatantly obvious, a combination uncomfortably common in Finnish national security. In short, the interviewed officer was colonel Magnus Liljegren, responsible for the production of Swedish air units and equipment at the Swedish Defence Forces’ general staff (designated C PROD FLYG in the Swedish Defence Forces). The colonel stated that “Finland is absolutely our top priority partner right now […] they are looking to us in order to increase their operational depth. If they need to withdraw they can move into our country and use our bases.” (full article over at JDW). From a strictly military perspective, this is an obvious solution. With the increased range of modern air defence and surveillance systems the Finnish air space is more or less contested throughout from the start of a conflict. There are significant benefits coming from operating from Kallax compared to Oulunsalo, not to mention Kuopio-Rissala. Side note: if Finnish fighters were planning to use Swedish bases, there’s really only one contender that makes sense for HX. The benefits of deploying to a base that already has everything you need to operate your aircraft in combat compared to having to bring your logistics train with you is huge. I haven’t seen any indication this would have been a marketing stunt (and I don’t believe it is), but we really should sort this out before 2021 if there’s a chance we would like to run along with the concept. At the same time, it would be an unprecedented political step. I highly doubt there is a Finnish politician ready to sign the paper saying we would join in the fray if Russian troops suddenly appeared on Gotland. Likewise, if we are supposed to use Swedish bases when attacked, that would mean that Sweden would join in a conflict they might not (yet) be part of. While that might be a hard sell to the voters, it would in fact make sense. If Finland would react to a Crimea-like coup aimed towards Gotland by mobilising the reserve and dispatching air and sea units to throw out the attackers by force and protect shipping around the island, there is in my opinion a higher likelihood that the conflict would stay local and limited in time. The reasoning behind this is the markedly higher deterrence value of the Finnish Defence Forces once mobilised and dispersed compared to their peacetime stance, as well as the increased striking power of the combined Finnish-Swedish forces. For Sweden, the situation is similar. In effect, Finland shields the northern part of Sweden from direct aggression, allowing the numerically small Swedish Army to concentrate their two brigades in the southern parts of the country, something that would also provide Finland with a measure of flanking support. The strength of the defence forces operating together is also larger than the sum of them individually, as the relatively small sizes of both countries means that some capabilities are found only in one of them, and that their combined size can reach quantitative thresholds (‘critical mass’) in areas where this would not be possible individually, both geographic and capability wise. “Finland will actively and extensively strengthen its international defence cooperation and other networking as well as develop the abilities to provide and receive international assistance. This is not an uncontroversial view in Finnish politics. Former foreign minister Erkki Tuomioja has apparently been able to gather enough support to get a majority of the parliament behind a strongly worded statement arguing for a reduction in Finnish participation in NATO-exercises and a ban on any Finnish military aid to Estonia in case the country would be attacked. Tuomioja represents the left flank of the Finnish Social Democrat Party, and the veteran politician has not only been able to enlist the support of his party (currently the largest opposition party), but also of the Left Alliance (fi. Vasemmistoliitto sv. Vänsterförbundet) and part of the MP’s from the ruling Centre Party (fi. Keskusta sv. Centerpartiet). The rebellion has deep roots in Finnish post-war history, when the Centre Party was the ideological home of Finlandisation, and the party has still a significant amount of people longing for the ‘good old days’ when we enjoyed a special relationship with the Soviet Union (i.e. not being able to have an independent foreign policy despite not being occupied or a Soviet satellite). While the situation during the Cold War might have called for some careful maneuvering, it surpasses my understanding why Finland in today’s world would strive to stand on the edge between western democracies and a Russian autocracy. This is especially strange considering that both Russia and our European allies consider us an integral part of the ‘West’, NATO-membership or not. #Russia/n AD drills. Enemy comes from #Finland. The youth organisation of the Finns Party (fi. Perussuomalaiset, sv. Sannfinländarna) in turn took the opportunity to suggest a joint Finnish-Estonian volunteer corps, ready to come to the aid of whichever country would be attacked (original presser in Finnish, blog post on the issue in English). While wordings such as “Failure to provide assistance would be a cold statement to our brothers and sisters. Finnish-Ugrian culture is best defended by the Finno-Ugric peoples themselves” are not necessarily ones I personally would use, the contrast to the careful language found amongst the more pro-Russian politicians is stark. While there to a certain extent do exist a left-right fault line in Finnish politics when it comes to Russia, there are also significant inner-party fault lines, as well as a difference between different generations. The presser also highlights the difference between the staunchly anti-Kremlin line of the Finns Party, and the pro-Kremlin narrative of many of Europe’s populist parties. This was painstakingly obvious when one of the leading national security voices of the Swedish Democrat’s party started advocating for Sweden to declare their intention not to give assistance to the Baltic countries, using an imaginary Finnish “decision not to help” as justification. Daniel Vikström: So when Russia threatens and invades its neighbors to secure its geostrategic interests, we should be humble about this? Added to this all, Finland ratified the Treaty of Lisbon nine years ago. The Treaty famously include clause 42.7, the so called solidarity clause. If a Member State is the victim of armed aggression on its territory, the other Member States shall have towards it an obligation of aid and assistance by all the means in their power, in accordance with Article 51 of the United Nations Charter. That an “obligation of aid and assistance by all the means in their power” would include direct military contribution would seem a no-brainer, not to mention the current talking point of whether NATO fighters could use Finnish airspace to defend Estonia in case the country was attacked. To sum it up, even if we skip any moral responsibility to help our neighbours, Finland has a number of self-serving reasons to intervene, or at least allow other countries to intervene (we don’t really want invading smaller countries to be an accepted part of international politics, and Russian weapons stationed on Gotland or in Estonia would be really bad for us). In addition, we have actually signed an international agreement promising to do so. That the prime minister apparently has seen a covert rebellion in his party over this is deeply worrying. There is a major problem with Russia’s continued large-scale military maneuvers, in that they could easily be used as a cloak for invading a neighbouring country. There is nothing wrong with letting the defence forces train. In fact, it is a crucial part of maintaining a functioning armed force. Exercises not only let soldiers on all levels practice their skills and get used to life in the field, but it is also the best tool available (short of actual war) for evaluating the standards of the force exercised and identifying possible shortcomings. However, as noted by Ben-Porat above, putting your forces in the field with equipment and logistical backup makes them ready to go to war. Especially if you include mobilising other supporting functions in the society and include live firings, as has frequently been the case with the large Russian exercise held during the recent years. Due to this, non-aggressive countries usually employ a number of different measures to build confidence amongst other countries that they in fact do not plan to go to war. These include e.g. pre-announcing the exercises, including key information such as scope, location, and stated aim of the exercise in the communique. Inviting foreign observers will also ease the tension. Placing major exercises far from potential flashpoints also helps. Certain elements needed, e.g. bridging equipment, can also at times be left out of the major exercises, and instead be practiced in smaller scenarios (though this is not always advisable, as there is a great benefit in practicing all parts of the machinery at the same time). Russia does none of these things. Instead, Russia has chosen to leave the CFE treaty. They have held a significant number of large and very large exercises, often in the western parts of the country, and sometimes very close to the border. In addition, the exercises are usually not pre-announced, but snap drills. These are exactly the kind of exercises that rapidly could turn into an invasion, and the fact that they take place with regular intervals also mean that a real build-up to an invasion would be hard to spot amongst the string of similar snap exercises. All of this wouldn’t be that much of a problem, if not for the continued aggressive behavior by the Kremlin, including invading and occupying part of two neighboring countries during the past eight years. The latest round of exercises is in effect nothing short of a mobilisation of a number of units in a composition that would allow for a swift transition into combat operations, and Russia doesn’t really seem interested in trying to disprove this notion. This resembles the build-up to the invasions of Georgia in 2008 and Ukraine in 2014, as well as the above mentioned intervention in Czechoslovakia, where a seemingly normal series of exercises in a number of Warsaw Pact countries suddenly turned into a full-blown invasion featuring over a quarter of a million soldiers from four countries. However, perhaps even more spectacular was the success of the Egyptian-orchestrated deception leading up to the Yom Kippur War. In the spring of 1973 the Egyptian army massed a significant force on the west bank of the Suez Canal. This included not only combat-ready troops, tanks, and artillery, but bridging equipment as well. Amongst the Egyptians were found contingents from other Arab nations, including fighter squadrons from the Libyan and Iraqi air forces. For Israel, standing on the opposite bank of the ‘best anti-tank ditch in the world’, this presented a problem. The Israeli army was made up largely of reservists, and mobilising would mean a significant disruption in the everyday life of the Israeli society. The Israeli intelligence community was also split, with the leader of AMAN, the military intelligence directorate, judging the risk of war as ‘very low’. The general staff of the IDF and the leadership of the foreign intelligence department Mossad disagreed. It was not that they felt that war was a certainty, but due to the consequences if war was to break out they argued for raising the level of preparedness. War did not break out in May, and the whole situation would probably have slipped into obscurity, if not for the fact that half a year later, the same situation repeated itself. On October 1, Egypt launched a large scale exercise codenamed Tahrir-41. This had been preceded by a general movement of troops towards the canal and a raising of the alert level in all three branches of the Egyptian defence forces. The development was closely monitored by the Israeli intelligence community, who actually got wind of the exercise already on the night between 24 and 25 September, when a division was spotted being moved towards the canal. They then continued to follow the build-up, which included mobilisation of reserves, cancelling leaves, and works on fortifications. In the same way, a build-up by Syrian forces across the ceasefire line in the Golan Heights was monitored, but dismissed as simply a defensive move following fears of an Israeli response following an air battle held earlier in September. A few dissenting voices were present in the higher echelons of the Israeli intelligence and defence communities. Notably, deputy chief of staff, and armoured corps legend, General Israel Tal, who insisted that Syria was preparing to launch an imminent attack, and that if the air force was neutralised due to weather or enemy air defences, the balance of forces was such that the Syrians would sweep through the Israeli defences in Golan and down into the Galilee. Inside AMAN, Lieutenant Colonel Keniezer, the officer responsible for Jordan, had got into an actual shouting match over the war threat with General Shalev, head of AMAN research sector, after Jordan’s king Hussein secretly visited Tel Aviv and warned Israeli prime minister Meir that Syria was preparing to go to war. Lieutenant Colonel Ya’ar, the officer in charge of Syria, also believed war was imminent, and bypassed the chain of command to warn IDF’s Northern Command directly. Colonel Ben-Porat, chief of AMAN’s SIGINT department, was also questioning the official line. He had been the one who studied the Soviet invasion of Czechoslovakia on location the year after it took place, and now asked for permission to call up 200 intelligence reservists and to activate the most secret listening equipment available to the department. However, General Zeira, the commander of AMAN, was not impressed, and, pointing to the similarities to the exercise held in May, got the final word. On the sixth of October five Egyptian divisions crossed the Suez Canal at the same time as three Syrian divisions launched an assault on the Israeli lines in the Golan Heights. The Yom Kippur War had begun. All pictures taken by author at Emek Ha’Bakha (‘Valley of Tears’) in Golan, site of one of the hardest-fought battles of the war. Growing food in northern Europe is the perfect example of a market failure. The weather is cold and unpredictable, the labour costs high, and few of the areas here are known for being particularly fertile. In strict economic terms, we would be better of letting someone in a warmer place produce the food, which we then could trade for something else. However, food is amongst the most basic needs of human beings, and maintaining a certain degree of self-sufficiency is a strategic interest. Enter the need for the government to step in and subsidize the farming sector. Interestingly enough, while the Finnish agricultural sector is very limited in the scope of people employed by it, the former Agrarian party is still a dominant force within the current Finnish political landscape. Exactly how this has come to be is an interesting question, but for now it is enough to note that the Centre Party currently is the largest party and holds the Prime Minister’s seat, and apart from including a strong agricultural wing, the party also has a history of leading the Finlandisation process during the Cold War. With this in mind, it came as no surprise when Jari Leppä, member of parliament and chairman of the Parliamentary Committe for Agriculture and Forestry, now joined a number of MP’s calling for an end to the EU imposed sanctions on Russia, so that the “market would get moving again”. While the EU has not imposed any sanctions regarding food products, Finnish farmers, and especially the dairy farmers, have been hit hard by the Russian counter sanctions. The alternative, according to Leppänen, is that EU would compensate the farmers “fully” for the downturn in exports to avoid “a single segment of the population paying for great power politics”, as he describes the current situation. This was rapidly shot down by both leading Centre politicians and the minister in charge of foreign trade (coming from the National Coalition Party). The government stands firmly behind the common EU-line, was the message, and minister Mykkänen also pointed out that with the Ruble being roughly half of what it was before the invasion of Crimea, the exports would unlikely be at the same level anyhow. While I greatly sympathize with the hardship endured by the Finnish farmers in general and due the Russian sanctions in particular, I still feel that Leppä’s move is purely populist in nature. Russia, Finland’s authoritarian neighbour, has invaded and forcefully annexed a part of another sovereign country two and a half years ago, as well as continuing to wage a low-intensity war there. Discussing ending the sanctions in the hope of getting Russia to end their sanctions, because we have to remember that it is a Russian and not a EU’s decision that stops Finnish dairy exports, is the completely wrong signal for militarily non-aligned Finland to send. Saying that that agriculture is the single sector affected by the sanctions/counter sanctions is also plain wrong. Several different manufacturing and service branches have been affected, either directly or indirectly by the downturn in Russian economy. The difference is that companies in other sectors have to bear their geopolitical risks themselves, which they also factor in when making export pushes in potentially unstable markets, a description which was apt for the Russian market long before Crimea. For the agricultural sector, the situation has been different, as the primary producers sell their wares to one of a very limited number of buyers, who then makes the decision where to sell the goods to the consumer. This means that the individual farmers can’t take part in deciding where to push their exports, while still, unlike workers in other sectors, they share in the economic risks due to often being small-scale entrepreneurs. This is in many ways the core of the problem for the Finnish agricultural sector, and has nothing to do with Russia in particular. Rather, it is a case of a poor negotiating position and a high economic risk leading to a very small room to maneuver when it comes to sudden shifts in the market. It is in many ways imperative that the government aids in trying to solve this puzzle, but if further compensation is to be paid, it should be done due to the disastrous rainfall this summer, and not because Russia has decided to invade their neighbours and implement sanctions on Finnish milk. Things are moving fast with regards to the national security policy of Finland (and Sweden). Late yesterday came the first reports that Hollande actually planned on activating article 42.7 of the Lisbon Treaty, requesting “other Member States shall [come to the] aid and assistance by all the means in their power”. If a Member State is the victim of armed aggression on its territory, the other Member States shall have towards it an obligation of aid and assistance by all the means in their power, in accordance with Article 51 of the United Nations Charter. This shall not prejudice the specific character of the security and defence policy of certain Member States. Commitments and cooperation in this area shall be consistent with commitments under the North Atlantic Treaty Organisation, which, for those States which are members of it, remains the foundation of their collective defence and the forum for its implementation. Now, exactly what the second sentence means is very much open for debate. For Finland, it has often been quoted as an example of why we won’t stand alone if attacked, even if we continue to stay outside of NATO. At the same time, no one in the higher political echelons seems to have been really interested in discussing what kind of a commitment it really is. When it now suddenly is activated, it apparently took the Finnish leading politicians by surprise. Minister of Defence Jussi Niinistö (PS) declined to comment at first, but 9 o’clock Finnish time (GMT+2) he tweeted out that Finland supports France, and that now he was off to see what France requested. The working group also assessed the needs for legislative amendments related to the granting of and requests for international assistance, especially in applying the solidarity clause and the mutual assistance clause of the European Union. The group analysed different options that would, if necessary, be applicable to decisions on granting and requesting assistance also in other situations of international co-operation. Finnish law does not feature a Japanese style explicit ban on military operations abroad. Instead there is an unclear situation, in which the current consensus amongst politicians is that Finland can’t directly provide support. The issue has been discussed since at least 2008, and got a new urgency last autumn, when it was suggested that the Finnish Navy would help Sweden in their search for the midget submarine that intruded on their waters, to which the Minister of Defence answered that it was not possible. A change of the laws to remove this problem and harmonise Finnish national laws with the Lisbon Treaty is in the works, and is set to be finished early next year. Finland is ready and willing to assist France with means available. We abide by the mutual assistance clause. Parliament has been informed. Before that, however, Mogherini had already came out of the EU Defence Ministers’ meeting declaring that all countries had confirmed that article 42.7 was now in use, so any other message from the PM would have been remarkable to say the least. Later in the afternoon, it was the President’s turn to speak, and President Sauli Niinistö held a short speech and answered a few questions for the gathered press. Given the short notice, the amount of journalists present was impressive (at least in the eyes of a layman). On the whole, the continuous stream of article and interviews that Finnish media provided throughout the day was in stark contrast to the almost complete silence of their Swedish colleagues. This is especially interesting, given that Sweden is not only bound by the EU treaties, but also by their unilateral declaration of solidarity. The President’s speech not only repeated what Kanerva, Sipilä, and Niinistö had said, but also emphasised that Finland from the beginning had said that we support France, and that any other answer had never been thought of. Still, when faced with a direct question, he admitted that it was somewhat embarrassing that seven years into the Lisbon Treaty Finland still couldn’t provide military help to our EU allies, due to a legal technicality. He also mentioned the migrant crisis, and Russia’s role in defeating ISIS and bringing back peace to Syria. Comparing the resolve of both Hollande and Putin when they had promised to go after those who were behind the Paris Attack and the bombing of the Metrojet airliner, he was hopeful that west and Russia in cooperation perhaps could bring an end to the conflict, although he added that this might as well lead to nothing. Regarding the prospect of Finnish help, Niinistö found it unlikely that France would request soldiers or policemen, but noted that we can provide intelligence. I find this view somewhat bothering. As the Lisbon Treaty is an important part of Finland’s national security strategy, it would be important that we go beyond the bare minimum requested. If military power is out of the question, we could either provide policemen or border guards. The Finnish border guards are trained and equipped to basically the same standard as the regular army, but is organised under the Ministry of Interior in peace time, and as such would provide an option. Of special interest could be the Erikoisrajajääkärit, the special forces of the border guards. A unit of these sent to assist French border police would send a strong message to anyone doubting Finland’s commitment to EU’s common security. Speaking of Russia, they seems to finally have launched some serious strikes on ISIS, this time bringing in cruise missiles from the Mediterranean, indicating the use of submarines as launch platforms, as well as reportedly employing all three strategic bomber types in use, the Tu-22M3, Tu-95MS, and Tu-160, in strikes. It is hard to see any tactical need for these types of platforms in this kind of a conflict, so the emphasis is probably on politics. In a video released that purportedly shows the air raids carried out by the Tu-22M3’s, two planes in level flight at altitude drop a large number of relatively small unguided (so called ‘dumb’) bombs. This is a tactic known from the Soviet war in Afghanistan, and is very safe for the planes against an opponent lacking proper air defence systems, but also woefully inaccurate and good for little else than levelling small villages or city blocks. Jos pol johto käsittelee EU #turvatakuut pyyntöä vasta perj kannattaa ostaa Hel#€&i lisää a-tarviketta…apu meille viipynee myös tulevais?